EDMUND RANDOLPH. Document Signed as Secretary of State. 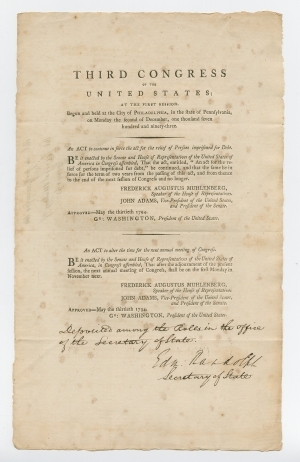 An Act to continue in force the act for the relief of persons imprisoned for Debt and An Act to alter the time for the next annual meeting of Congress, May 30, 1794. Philadelphia: Childs and Swaine. 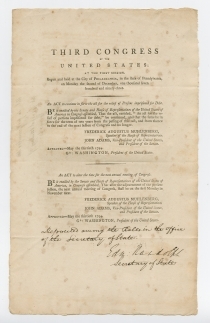 Signed in type by George Washington as President, John Adams as Vice President, and Frederick Muhlenberg as Speaker of the House. 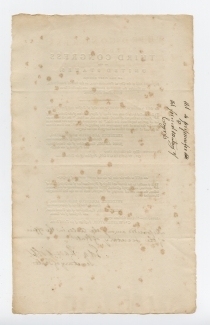 1 p., 8¼ x 13½ in.